What&apos;s new in OrientDB 3.0? OrientDB v 3.0 has a new API that is specifically intended to manipulate database instances (ie. creating and dropping databases, checking that a DB exists, creating single db connections and connection pools). No more doc.field("name") and vertex.getProperty("name")!!! Property names can now contain any character, including blank spaces, dots, brackets and special characters. 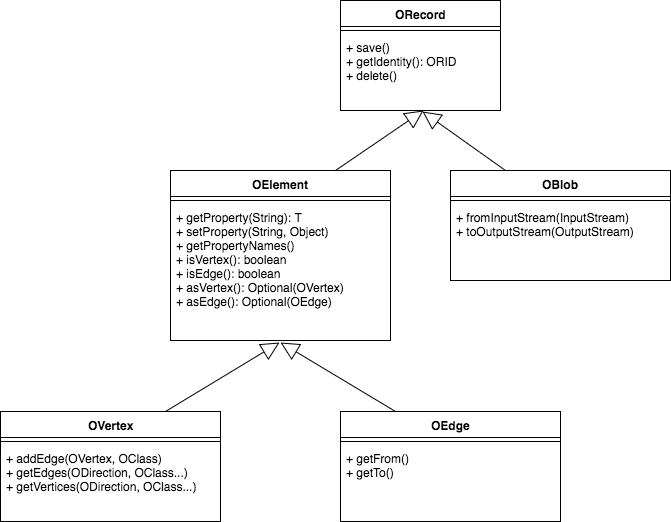 OrientDB team completely re-wrote the SQL query engine. The new query engine is more strict, more accurate and explicit in the execution planning and of course faster! Until V 2.2 remote connection did not allow to mix API operations and SQL statements in the same transaction. Version 3.0 finally solves this limitation, now you can mix SQL and API operations in a single, remote transaction and the tx isolation will be guaranteed by OrientDB, transparently. OrientDB v3.0 is compliant with TinkerPop 3.x through an external plugin. OrientDB v3.0 is backward compatible with TinkerPop 2.6.x API through an external plugin. If you built your application with OrientDB 2.2 or minor and you don&apos;t want to migrate to the new API (the new Multi-Model or the new TinkerPop 3.x APIs), then download the version with TP2 plugin included. The Object Database API is now part of a separate module. If your existent application is using it, please include this module. For new application we don&apos;t suggest to use the Object Database API, but rather the new Multi-Model API. Starting with OrientDB v.3.0 a new demo database is included. More information on the new demo database can be found here.